We thoroughly enjoyed our Cinque Terre tour with Antonella. She met us at the port. She knew how to change up the tour according to the crowds. We enjoyed the boat and train that took us to the different village. She is knows her history. I would definitely recommend this tour! Antonella was very punctual and well presented. She was pleasant company and extremely knowledgeable. Antonella made recommendations for dinner and kindly booked us a fantastic table and arranged our transport to the restaurant. TOUR GUIDE RESPONSE: Thank you Jillian ! I am very happy you enjoyed dinner in Portovenere . It was a pleasure to be your guide ! Grazie ! Antonella was a great guide. She adjusted to our needs and preference. The dining table she had reserved for us was OUTSTANDING. Could not have been better. Thank you, Antonella. 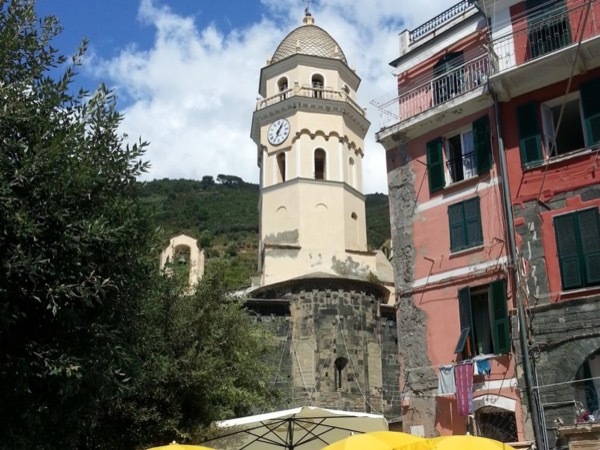 Antonella made our tour of the Cinque Terre unforgettable and easy. We really appreciated her compassion for some of our travelers who had some difficulty with walking. Her knowledge of the area was very helpful and informative. Recommend her very highly! TOUR GUIDE RESPONSE: Dear Barbara , Thank you very much for your very kind words ! It was a pleasure to know you and your family . I hope to see you again in Italy . I wait for you for discovering other beautiful villages of my Region . My best wishes to you and your son ! Antonella . Antonella was awesome! We had a group of 36 people and had a plan to take a boat ride up the coast and a train back. However, the seas were too rough that day and the boats were not running. Antonella quickly created a contingency plan to take the train both ways and we were still able to accomplish almost everything we originally planned despite the weather. She is extremely knowledgeable about the Cinque Terre region and would highly recommend her for a small or a large group! TOUR GUIDE RESPONSE: Dear Randy, Thank you for your comment! It was really a pleasure to be your guide. Also the boys and girls were lovely ! I hope to see you again in Italy Thank you again! Antonella. M Thank you again ! Antonella arrived as promised and modified the tour to meet our desires and timelines. She showed us the "best of the best" and made our tour memorable. I will use Tours by Locals again and I recommend Antonella to everyone. We shared a wonderful experience at Cinque Terre with Antonella. We are grateful to have had a guide to share the history and details of this beautiful area as well as navigating us through the transportation to and from the area. It made for a more meaningful experience to have had Antonella's expertise.